Virtual Reality is revolutionizing the world of drones. Exciting head mounted visuals and displays are increasingly being preferred by drone amateurs and experts. FPV or First Person View Flying is gaining prominence. Though the traditional style of goggles has been prevalent, VR headset technology fused with FPV gear promises something remarkably different. With drone models evolving consistently, manufacturers are now introducing VR headsets with them. I have to say that the fun and the immersive experience which a VR headset with a drone can give can rarely equal other hand-held tech devices. Once the drone delivers footage from its camera to your headset, you can look around and view all around from the drone’s point of view. Apart from a exploratory experience, you can expect to feel like you are flying in the sky and viewing everything from the sky! Let’s check out what factors you should look out for before you get your virtual reality headset with drone. When you are wearing the headset with your drone, you will certainly want some level of comfort. If you are spending consistent sessions with your drone, you don’t want a headache or blurry eyes. Make sure that the VR headset fits your head snugly. That being said, you cannot just pick up a VR headset and drone off the shelf and wear them together. Compatibility, ease of use and good reviews are some of the many factors, you will check out before making that purchase. First Person View – FPV allows you to view the drone and its flight in real time which a lot of drone pilots like to do. Well, few pilots also say that using the point of view lets them to experience an immersive experience and enjoyable play times! While standard FPV headsets may be more suitable for experienced drone racers, it is not really a determinant if you are not flying one of the quicker drones. With a higher picture clarity and clearer display, the FPV headsets can be used independently as well. If you wish to use them with another apparatus, you can do that too. You will also be amazed by the improvement in your drone piloting skills. Enjoy the never-seen-before views and images captured when you see from the drone’s view! Oh, you can also try using the other GPS attributes such as returning home and waypoints which can be a great help if you don’t want to fly the drone yourself. If you prefer making use of the automated flying features inbuilt in the drone, you may choose to make the drone fly manually without using the VR Headset. 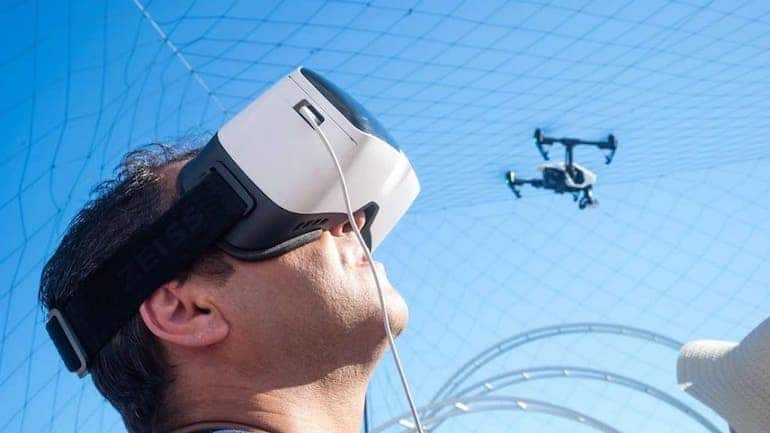 Many drone enthusiasts have shared the enhanced flying experience they have experienced once they incorporated VR headset technology with their drone usage. Do remember to check the viewing range of the virtual reality headset. The ideal range of view should be somewhere between 25 to 45 percent, while a higher span is preferred as it benefits better observation. doing so as unlimited battery power is not yet prevalent. An average flight time of 20 to 30 minutes is basically more commonplace right now. Using heavy flying directions tend to drain out the battery quickly. Simpler flying styles end up conserving the battery life. You can even consider adding more batteries to get better flying times. VR headsets for drones are mostly lightweight and can be easily installed. If you are doing it yourself, checking out the product manual is advisable. Make sure you get a snug and comfortable fit on your head. Positioning them properly can also assist in getting a smart, 360-degree view of the area using certain programs available in the VR content. Using virtual reality headset with your drone offers the benefit of head monitoring as well. You have to contend with the fact that the VR program also tends to break the display into several screens which end up reducing the display quality. If you are planning to create content with the camera feature of the drone, getting the VR headset with the drone can be a useful idea. Do check out the quality of the drone camera as that would be crucial in producing good quality content. It is preferred to have a 3-axis gimbal for camera mounting that ensures the safety of the camera. It also helps avoid unnecessary jerks or movements of the camera to give you a smooth image capturing the experience. You can get a 4K camera for most middle and high-end drones. 4K offers good detailing and high image clarity, while the low 30fps can be a bother sometimes. For slow moving things, 30fps will be just fine. If you want to shoot fast moving objects, you can consider reducing the camera resolution to 1080p at 120pfs. You can check out the camera resolution also in various models which typically start with 12MP. If you need high quality and professional images, consider cameras which offer a resolution of up to 20MP. 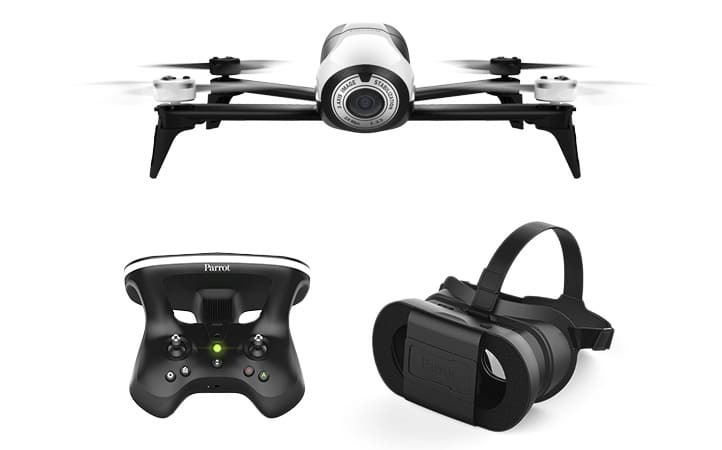 Did you know that several options are available if you want a drone with a VR headset? Getting VR Drones with the headset is an option. Otherwise, you can also pick a drone and then select a compatible VR headset to go with it. In this guide, we have simplified the options for you by reviewing the VR Drones with headsets which can be operated using your smartphone or another device. Though there are a wide variety and quality of VR headsets available, you can typically expect to spend $30-100 to get a decent headset. One of the most novel VR drones with headset available is the DJI Mavic. Getting this awesome combination of DJI Mavic Pro with the DJI headset promises to make your drone experience fun by including that virtual reality edge. In normal drones without the VR headset, one person needs to manage the controllers while another takes camera pictures. If you consider the Mavic Pro, it has a simple model with the camera enclosed within the gimbal in a clear casing. With a 1:1 compatibility of the camera and your head, the VR headset allows you to control the camera and the flight controllers at the same moment. 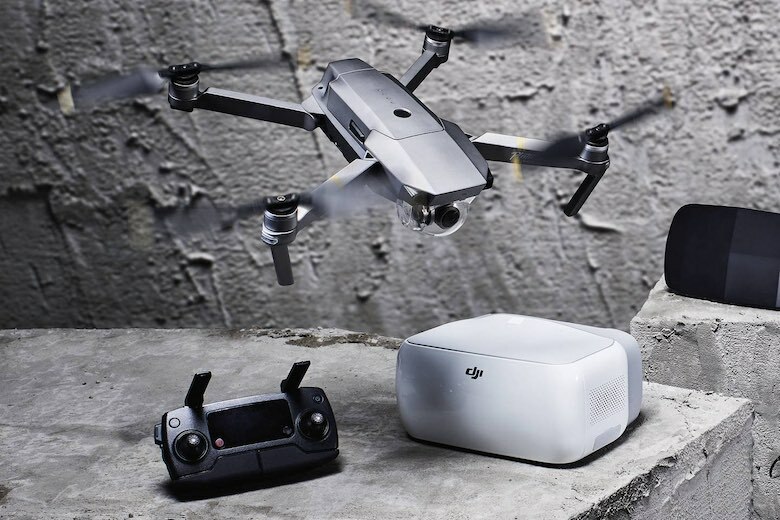 Though not as powerful as DJI Phantom, the DJI Mavic appeals to both regular drone enthusiasts and drone experts. Discover more about DJI Mavic Pro. When the camera revolution started, the first Parrot AR Drone actually captured all the attention. Eventually, the camera feature has stabilized with the DJI enamoring the attention of the drone regulars. Even today, Parrot is manufacturing remarkable drones and have their band of loyal followers. If you are looking to have a drone which is simple and easy to get started with, then Bebop 2 is a model you should certainly consider. Manufactured and distributed as a set, the Bebop 2 FPV has a user-friendly and classic design which the design lovers are likely to be impressed with. If you are planning to shoot 1080p movies or 14-megapixel pictures, the Bebop 2 can be a good choice. Though the gimbal axis is not present, the 3-axis digital stabilization feature is useful for amateur camera drone users. You can use your smartphone and compatible software to get started with the VR as the eyeglasses which come bundled don’t have any video hardware prepackaged. You can start viewing with wireless transmission, once you slide your smartphone in place. Lightweight in size and well endowed with a 25 minute flight time, the Bebop 2 is a good alternative for the DJI Mavic. Since it comes with the sky controller, you can expect the Bebop 2 to fly for about 1.9km which is decent for flying long distances or exploring areas. Discover more about Parrot Bebop 2. The DJI Spark with VR is one of the newest and smallest drones on the block. Though small in size, it’s first-person view skills are quite mature. Quite a few users shared that the newer Spark model is compatible with the majority of the VR headsets available in the market. Even though the Spark is quite affordable, there are a lot of useful features packed into the Spark. You may use the DJI program to use the automated flying feature or maintain controls manually. You can use the dedicated audio feature at the time of using the VR with the DJI headset. Some users also use the drone flight feature till the virtual reality setup is ready. If you want a small but useful drone, you can consider the Spark. Shelling out a few dollars more will allow you to get the VR headset, radio and enjoy the complete VR experience. Discover more about DJI Spark for VR. With VR disrupting the drone market, FPV headsets and goggles sort of old school. I was surprised to discover that Ehang Ghostdrone has the FPV headset with this drone model and guess what, it is also high on the popularity list of VR drone enthusiasts! Though pretty much traditional, these goggles have the advanced technology of head tracking built in and serves to activate the gimbal which turns the camera on its axes. For a movie transmission experience, the range is pretty limited within 800 meters. I quite like the feature of the 4K video in a self-tightening mode with trolling motors positioned upside down for enhanced stability. I found its flight to be for a maximum of 25 minutes which is in the performance range of premium drone models. Getting an advanced Android or iOS kit edition is recommended to ensure that smart flight features work well. Interchangeability between iOS and Android is not yet available for this model that can be a letdown for many people. Check out the Ehang Ghostdrone now. The Walkera furious is a racing drone model which comes packaged with the Goggle4 FPV Glasses for an enjoyable flight experience. For some users, the pricing may actually feel like an investment but then many true-blue drone racers like the flexibility and durability of the model ideal for drone racing! I found the build quality of the Goggle4 FPV Glasses to be quite sturdy. Well, if you maintain it well, it should last you at least many years of drone play without any signs of wear and tear. If comfort is a priority, this drone and headset can be suitable choice as many users found it comfortable after use. A 5-inch LCD display with a maximum of two hours operation time is relatively reasonable as compared to other drone models. To increase the run time, you can consider including more batteries. Check out the Walkera Furious now. Even though there are many virtual reality drones with headset available in the market, they are relatively new in the space. If you are considering trying out one, this can be actually a great time to know more about them. Using virtual reality technology with drones can be a very effective way to keep track of big land plots, industrial buildings or farmland. You can even schedule and complete many surveillance activities. Capturing high-quality aerial footage has become very doable with the camera feature of the drones. Drone play, racing or simply visualizing spaces or using the camera, VR drones promise to keep you engaged for long. With so many diverse ways of using them, you will be entertained by VR Drones with headsets for hours before you even realize as time passes by!